We’re open 6 days a week to better accomodate your beekeeping and honey needs (and cravings). Check out the store hours below. * On major holidays, please check the website for our store hours! Walk back in time at the Tackett’s Mill Shopping Center where you’ll find a rustic inspired design complete with dining options, relaxing lake views, and even the old Tackett’s Mill restored to its original glory. Tackett’s Mill Shopping Center is dividing into two portions – an upper side and a lakeside. On the upper side, you’ll find a more typical shopping center with a Giant and Pet Valu store. Circle around back to find a quaint reserve where you can meander around the lake on a covered bridge, visit local shops, and taste the new menu at the lakeside grill. When entering Tackett’s Mill from Old Bridge Road, turn onto Harbor Drive and continue straight until you pass the Merchant’s Tire on your left. Take the next right and stay a left at the Y intersection. Continue straight – you’ll dead-end into the parking lot that services The Bee Store. 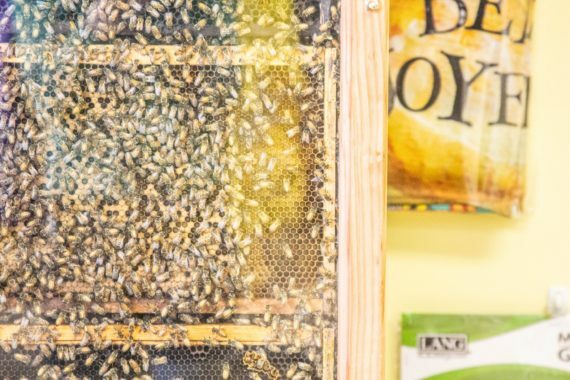 The Bee Store in Lake Ridge, Virginia has a functioning beehive right in the store! This 5-foot tall observational beehive is a real life look into a growing, thriving hive of honey bees. Within the store, the beehive is encompassed on both sides with glass panels letting eyes get up close and personal with the inner workings of the hive, the worker bees, and even the queen. This is a live beehive, so the bees can leave and enter the hive through a long, see-through pipe that leads to an outside entrance and exit for the bees – it’s even visible from the ground. Come visit The Bee Store! From hours to directions, you’ll find everything you need to enjoy a few hours at this Lake Ridge gem. Make a day out of it! 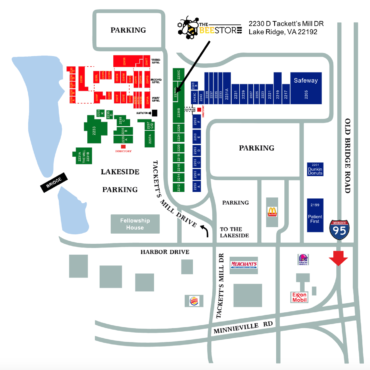 The Bee Store is really close to both Ikea (who doesn’t want to assemble furniture?!) and Potomac Mills Mall – chock full of discount deals and steals!